In my last post, I was discussing the construction of ‘Christendom’ in Europe, the role the emperors played in that, and then about the dismemberment of the Western Roman Empire. I probably sound like a catastrophist in that, but I can assure you I am neither a catastrophist nor a continuitist. And if those words mean little or nothing to you, be glad. 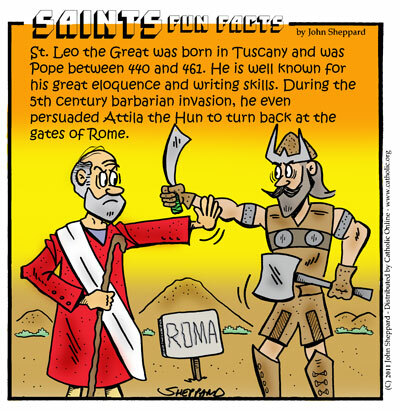 Pope Leo the Great (r. 440-461) was not unaware that Valentinian III’s empire was being slowly dismembered. As an acolyte, back in the good ol’ days, he’d visited North Africa on a papal embassy. But by the time he was pope, North Africa was not part of the Roman Empire. Increasingly, neither was Spain nor Gaul. It had been 30 years since the legions left Britain. But here’s what Leo did, and here’s one reason why we should think him Great. He kept the church running. In his letter to the bishops of Mauretania Caesariensis (present-day Algeria), he told them that invasion and persecution were no excuse; ecclesiastical order and canons had to be upheld. Now, this may sound like Leo being a hardass. And really, to a degree it is. Leo can be; it must be admitted. Nonetheless, it is something more. It is Leo saying that the life of the Church can continue, that order can be maintained, even when the Empire is no longer there to keep order. Leo would also temper the canons with mercy and then hope that the local church could make its own rulings in many cases. And what he did in North Africa, he did in northern Italy (irregularities and problems resulting from Hunnic attacks), southern Gaul (irregularities and problems arising from Visigothic attacks), and Spain (irregularities and problems arising from Alans, Vandals, Sueves, and Visigoths; including a resurgence of Manichees and Priscillianists). Leo created a network of bishops in the West who listened to him, sought his advice, and tried to implement it, not only in his jurisdiction as Metropolitan Bishop of Southern Italy, and not only as a court of final appeal, but in other aspects of the liturgical feasts, the doctrine, and the organisation of the church throughout Gaul, northern Italy, the Balkans, North Africa and, to a degree, Spain (the one letter to Spain may be spurious). This vision of the Bishop of Rome being a figure to rally behind, being someone to help keep order, regardless of who ruled you, who ruled him, and what those rulers’ religion was, was one succeeding Bishops of Rome would take up. It was also something that helped provide religious and cultural cohesion even as political cohesion eroded. Before going further, I admit that if the popes and bishops hadn’t done it, someone else might have. The cultural capital of the West was far from gone. In that sense, I am not a catastrophist — everything did not suddenly descend into utter chaos with the ‘fall’ of Rome. A lot of taxation continued, local church councils continued, the monastic project continued, evangelisation continued. Nevertheless, the Bishops of Rome were actively engaged in creating networks of authority that could rally behind the image of Roma Aeterna, Roma Invicta, even after 476 when no emperor was left. Susan Wessel, in Leo the Great and the Spiritual Rebuilding of a Universal Rome, argues that Leo is the one who really gets the ball rolling. She’s probably right. And why Leo? Well, his papacy was extraordinarily long. Furthermore, he was involved in the great theological crisis of his day, and spent all of his papacy in the intellectual vacuum left in the West by Augustine’s passing, and most of it in the similar vacuum left by Cyril of Alexandria. 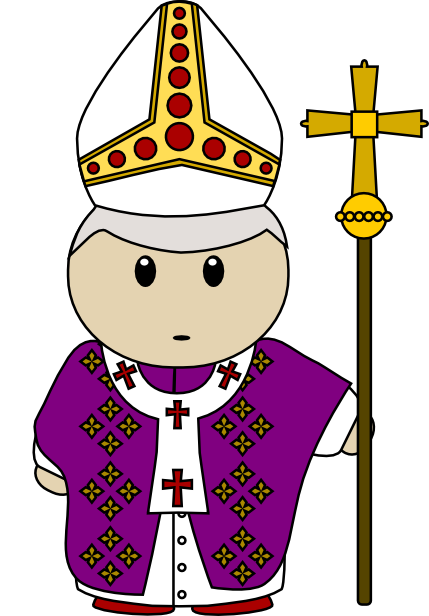 As a result, he’s our first pope with lots of sermons and letters and theology and canon law flowing out from Rome. The following popes would continue this, working towards a united western church with a united western culture. Since it was the popes, bishops, and monks, rather than the Roman aristocrats and their successors (although they often patronised the popes, bishops and monks!! ), who really worked to create some semblance of cultural unity across the post-Roman kingdoms, this strikes me as a determining factor on how Europe is distinctively Christendom even after the Empire ceases to be, and so ceases to be God’s vehicle for the transmission of the Gospel. Most famously on this blog, we see this activity in Pope Gregory the Great (saint of the week here) sending Augustine of Canterbury (saint of the week here) on his evangelistic mission to Britain. He also wrote his Book of Pastoral Care that was such a hit, the Emperor Maurice in Constantinople had it translated into Greek and distributed throughout. We have over 500 letters from Gregory the Great as well as numerous other theological works and a major liturgical work under his name. Another saint of the week, Boniface, was also commissioned by the popes of his day in the 700s. They were funding missionaries and supporting local bishops. The western church’s network of influence thus involved the founding of monasteries and the building of late Roman and Romanesque cathedrals. That is to say, the Church, guided by the two Great Popes, sought to maintain a semblance of order as the Empire fragmented. Furthermore, through fostering learning in the monasteries such as that at Lérins and, later, those following Benedict’s footsteps or way off in the Isles, in the oft turbulent (but never completely darkened) years that came, the Church kept western literary culture alive, giving us Columba and his poetry (saint of the week here), Bede (saint of the week here), Alcuin, Caesarius of Arles, and many, many more. So, could you please bring Charlemagne into this? As the popes are doing their thing, post-Roman politics continue apace. Visigothic Spain stabilises. The Franks, beginning with Clovis I (r. 481-511; his wife, Clotilda, was saint of the week here), began conquering more and more of Gaul and all the neighbouring territory, beyond the boundaries of the Empire That Had Been. The Eastern Empire (‘Byzantines’) had regained North Africa, a few bits of Spain, and Italy by the mid-500s. In the late 500s, they lost Northern Italy to the Lombards who invaded. The Frankish realms are interesting from a political perspective because the Frankish royal houses did not establish a game of ‘one son gets it all’, so the territory would move between powerful kings with everything, powerful kings dividing it amongst themselves, powerful kings fighting it out, weak kings with ostensibly everything but ruled by the Mayor of the Palace, the Mayor of the Palace becoming the new king (Carolingians), and then the whole thing doing its thing again. Whew. Skipped a lot. That probably really didn’t help you at all. If you really are sincerely interested in Early Mediaeval political history, I recommend Chris Wickham, The Inheritance of Rome, and check out chapters 5, 6, and 16 for the Franks and the Mediterranean in this period. And then read the whole book, which also includes culture. Wickham is a fabulous historian. So, back to Charlemagne (r. 768-814). 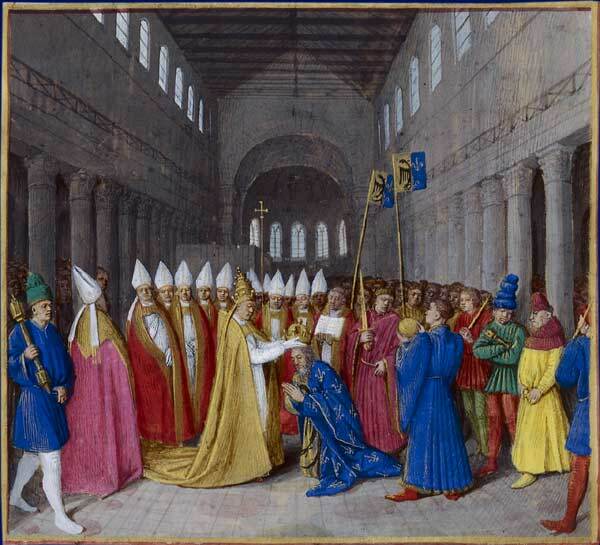 Jean Fouquet, ‘Coronation of Charlemagne’ from 1460. Note the misplaced beard. The significance of this Leo is that his patronising of bishops and emperors goes far beyond his fifth-century predecessor. 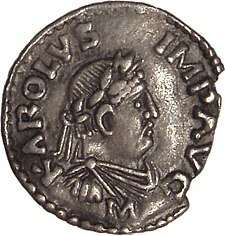 Whereas Leo the Great acknowledged the legitimacy of Valentinian III, Petronius Maximus, Avitus, and Majorian in the West, as well as Theodosius III, Marcian, and Leo I in the East, and enlisted their help in pursuing his papal goals, Leo III helped make Charlemagne Emperor. And so crown and mitre were intertwined. The Middle Ages are being forged in that ceremony. And Christendom is moving beyond a cultural network that helps keep monasteries and missionaries and art and culture flowing. It is moving itself deeper into the power politics of its age. … and we, today, are witnessing Christianity moving out of the power politics of our age. This afternoon, I read through the Canons of the Council of Nicaea (325), the Canons of the Council of Serdica (344), and the Apostolic Canons (before 347), looking for precedents for the statements in Leo’s decretals. I found a few, and I found some other interesting things along the way. By and large, these fourth-century canonical documents show us a concern in the Church for the behaviour of ambitious bishops. Bishops are restricted from being translated to different cities. Restrictions are placed on the elevation of small towns to bishoprics. Bishops are not allowed to treat church wealth as their own; neither are their heirs allowed to inherit church property. People aren’t allowed to enlist secular authority to get their hands on a bishopric. Alongside the bishops, the other clergy are a concern. They can’t just up and run off into another diocese whenever they feel like it, for example. And they will be deposed for a variety of issues. What we see in the fourth century then, as councils are gathering and people are forging documents in the apostles’ names, is a church that has a bit of disorder but which, now that it is emerging from hiding, hopes now to gain more order and curtail abuses, since things can now more easily come to the light of day. If a bishop, presbyter, or deacon shall strike any of the faithful who have sinned, or of the unbelievers who have done wrong, with the intention of frightening them, we command that he be deposed. For our Lord has by no means taught us to do so, but, on the contrary, when he was smitten he smote not again, when he was reviled he reviled not again, when he suffered he threatened not. If any clergyman shall strike anyone in a contest, and kill him with one blow, let him be deposed for his violence. If a layman do so, let him be excommunicated. If any of the clergy be found eating in a tavern, let him be excommunicated, unless he has been constrained by necessity, on a journey, to lodge in an inn. If any of the clergy mock the lame, or the deaf, or the blind, or him who is infirm in his legs, let him be excommunicated.In like manner any of the laity. Finally, the issue of passing on church property as inheritance. While celibacy for deacons, presbyters, and bishops was the norm in the Roman Church since an early date, the universal application and legislation of the rule during the Gregorian Reforms of the latter half of the 11th century was due in part to the issue of inheritance. Bishops and presbyters were acting like ‘feudal’ lords and passing on church property to their sons. A bishop must not, out of favour to a brother or a son, or any other relation, ordain whom he will to the episcopal dignity; for it is not right to make heirs of the bishopric, giving the things of God to human affections. Neither is it fitting to subject the Church of God to heirs. But if anyone shall do so let the ordination be void, and the ordainer himself be punished with excommunication.